Proof! 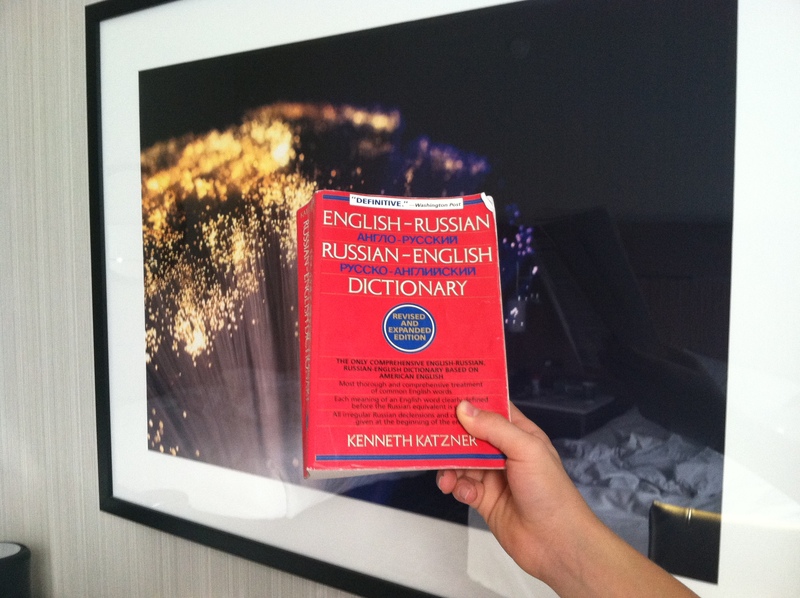 Kenneth Katzner’s Russian Dictionary in front of the Hyatt Regency Space Picture. Room 164. Visiting with my son and my brother’s family last night in New Jersey, I saw Gravity for a second time. When I came out the first time, I was so blown away by it, I made an internal declaration to never view it again because I didn’t want to feel it diminish in my estimation with a second pass. I wanted to preserve its wonder in perpetuity, like Pauline Kael who famously never saw a movie twice. To be fair she passed away before having to work her way through the thin pickings of Xfinity On Demand. But, anyway, my ‘special date one night only commitment’ with Gravity didn’t last and I was back in the theater. The good news here is that Gravity actually held up well under a second viewing. This time in simple 3D versus IMAX 3D, the latter having better glasses and a more immersive experience, but the film is exceptional in both formats. I forbid people to see it in 2D. You might as well see the version without gravity, too, to save money. But anyway I noticed a number of things I’d missed the first time. Here are five that stood out. 1. Sandra Bullock’s last name is, metaphorically but not ponderously so, Stone. 2. Her daughter died from a gravity accident on a playground: to wit, she fell and hit her head. 3. The family physicists, my son and my brother, both pointed out in the parking lot that the thermonuclear surface tension quantum mechanics of the tears were all wrong. (They were saying something like that, and it was important to them. Lots of other physics problems too. Yawn.) 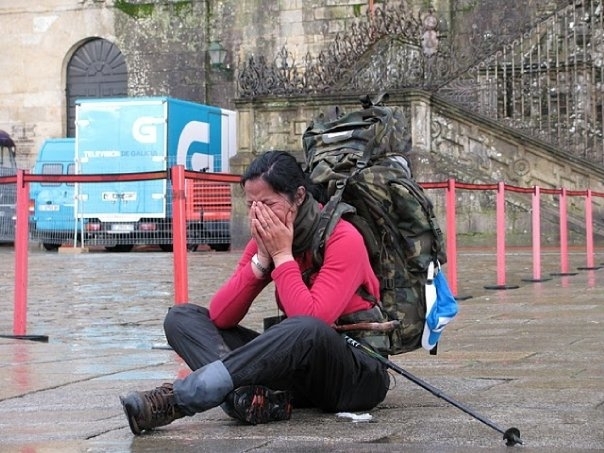 With a video on YouTube back at the hotel, Daniel showed me that tears in space tend to glob up into pouches and stick to the eye rather than float in lovely, shimmering raindrops. My son and his uncle were born to talk about these things to each other. In an almost punishing turn of events for both, they spent their respective childhoods having to relate their scientific observations to me. Granted, I’m not much of a fact-checker and I’m easy to impress. 4. Stone is saved from her final free-floating peril not by aiming the fire extinguisher nozzle to create her direction, but by throwing it. After the extinguished empties at last, she chucks it and the equal and opposite force effect sends her towards the craft and saves her. It almost goes by too fast to take this little piece of poetry in, but it’s sure-enough there. I was not able to discern whether the throw is set up dramatically as a moment of frustration or to be a calculated piece of physics on the part of the astronaut. For the record Daniel and Chris would throw it from calculation. I would throw it from frustration. We’d all end up happily inside the space station. Yay! We made it! When I was a senior in high school, my father gave me a red Russian-English dictionary in hardback that he’d found through his publishing connections before it was commercially available. It was very heavy and very thick, a doorstop of a dictionary, and it became the Russian dictionary I used through the remainder of high school, into college and then far beyond. Kenneth Katzner’s English-Russian Russian-English Dictionary. I used to lug that dictionary to Butler Library and back again, a giant brick of a thing under my arm. Katzner’s was the first dictionary of its kind to translate Russian into “American English” and when I had it in college nobody had heard of it or owned it, not even the publish or perish teachers who presumably should have been keeping tabs on this sort of thing. But it’s a great dictionary for the American Russian student, and mine eventually became black on the Russian look up pages from thumbing through it. I was always very proud of that wear. Eventually, the cover came flapping off and then the binding split apart. I started to float off in space there for a minute, but I’m back! We were talking afterwards about the film and I shared the fact that I’d seen it and, with a serendipitous delight, shared that I have the dictionary back at the hotel with me right now. It was the only book I brought with me on a business trip back east this week. (Susan Wright, I lied and said I didn’t bring any books on my trip and needed something great to read, but I was embarrassed to mention I brought a dictionary for pleasure). Anyway, my trusty book has made it into space, or at least into pretend space, which is almost as good. So here’s to dad’s best gift and to Kenneth Katzner’s English-Russian Russian-English dictionary! Cheers! And if by some strange Google search trail you should happen to find your way to this note and you know anything about the real book being in space or about the art department that put it there, please share immediately or curses upon your descendants. Alright, one final mention just for the search engines: Kenneth Katzner’s English-Russian Russian-English Dictionary in the movie Gravity, and if you enjoyed that, you might enjoy this. Kenneth Katzner was my uncle. I loved your post. I of course TOTALLY missed his “cameo”, I’ll have to see Gravity again. Thank you! Hah! I love the Internet! I’m completely delighted you found your way to this post. Seeing your uncle’s book float through frame was like unexpectedly spotting an old friend in an acting role. That I happened to have a copy of it at the hotel that same evening was a marvel of serendipity. I was a Russian Language and Literature major in college, but started Russian in 7th grade in 1978. (I was going to be a spy, like James Bond.) I studied Russian in high school between the two – and for years after college I kept at Russian as well. Your uncle’s work was and remains the gold standard for me. Beyond the definitions and structure, I loved the feel of it, the fonts, the appendices, the life in its pages that distinguished it from its peers. The original hard-cover version was a sort of Bible for me, a pair of favorite old shoes, a t-shirt riddled with holes you can’t bring yourself to throw out. I’m sure he had many better students working with his dictionary, but few that loved or appreciated it more. Please feel free to tell your cousins (or aunt) that you found their father’s biggest fan. Thanks again for your note. And do see the film. You will not be disappointed. And if you have any fun information to add regarding your uncle or his life’s work, please feel free to post here or privately at anathan@teambrainbox.com. Kind regards, Adam.